The R/V Lake Guardian’s recently completed survey of all five Great Lakes is not an unprecedented feat. In fact, this survey—which collected samples at over 100 stations this August alone—has taken place twice a year since the early 1980s, once each spring and again in summer. Something that is new, however, is how much of the work is accessible to us landlocked lovers of the Great Lakes. As the person at the helm for the @LakeGuardian Twitter account, I was overjoyed to spend the first nine days of August on board for the Michigan and Huron legs of this year’s summer survey. Officially called the Open Lakes Water Quality Monitoring Survey, this particular research cruise is important to highlight because it brings together scientists from around the basin to focus on contributing research to a long-term monitoring program that has been assessing the health of the Great Lakes for over 30 years. The fast-paced, round-the-clock nature of research cruises—especially one of this magnitude—hardly allows time for the scientists or crew to communicate the work they’re doing. But for me, being in the middle of all the action was the perfect time to gather and produce material to share with the Lake Guardian’s Twitter followers. 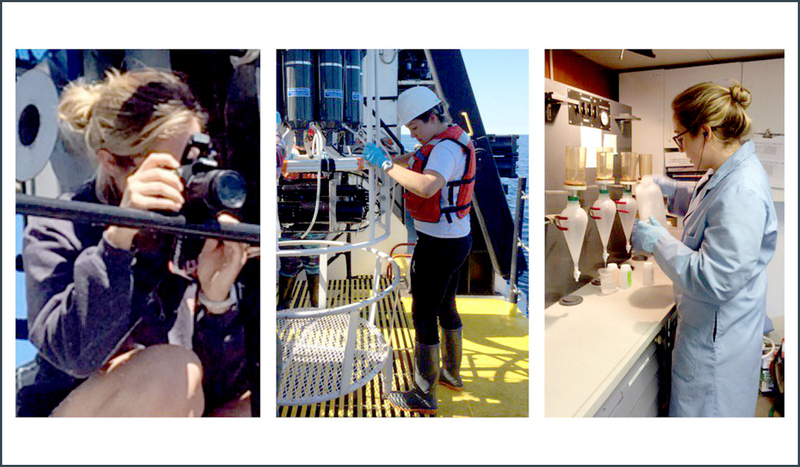 Using the hashtag #SummerSurvey2016, I chronicled the exciting, enlightening, and at times obstacle-laden journey of the survey through live Tweeting updates, photos, and videos from the Guardian’s sampling decks and onboard labs. The Guardian crew replaced the brake pad & the ponar winch is back in action! Working first and foremost as science personnel for the EPA water quality program, I labored 12-hour shifts each day. From 4 p.m. until 4 a.m., I had to suit up in steel-toed boots, a life vest, rubber gloves, and hard hat every time the ship arrived at a station and head out to the rosette deck to collect the water samples taken from several depths and specific layers of the water column. Bringing milk-crates full of water samples back into the wet lab, I then had one of two tasks: filter the water and preserve it for four different nutrient analyses or run board chemistry to determine the pH, conductivity, alkalinity, and turbidity of each sample. While this water-quality portion of the survey is being conducted, samples are taken simultaneously on the fantail, or back of the boat, to collect plankton and sediment. Any station reached after the sun goes down is also sampled for Mysis, an aquatic animal that resembles shrimp and is only active at night. All three onboard labs are constantly buzzing with sample processing and preserving—with researchers doing things like extracting chlorophyll a or flash-freezing microbial cells in liquid nitrogen. In every spare moment I tried to capitalize on the flurry of activity relating to both science and ship life. Showing off the research as it’s happening, making it accessible and informative, is the best way to tell the important story of the work being done to monitor and protect the Great Lakes. By the time I left, the Lake Guardian was preparing for her next trip, the Cooperative Science and Monitoring Initiative. The scientists have already started #CSMI2016, so be on the lookout for updates!